In an age of ceaseless social talk and relentless interconnected activity, it’s amusing to be reminded that all that interaction can be easily made invisible with the simple clicking “off” to a power button or closing of a screen. Words published online don’t dissipate like they do once out of the mouth and heard by the ears. Yet, the ongoing nature of digital communication is one of the simplest to dismiss if one chooses. How funny that the literal ways people receive messages might not translate to being the most effective, fleeting, or permanent that others initially presume and perhaps want them to be. Folk group extraordinaire, I’m With Her (Aoife O’Donovan-Guitar, Vocals; Sarah Jarosz-Guitar, Banjo, Mandolin, Vocals; Sara Watkins, Guitar, Violin, Ukulele, Vocals), appear to have stumbled upon this bit of insight with their newest single, “See You Around,” which is the title track from their just-announced full length debut of the same name, coming 16 February 2018 via Rounder Records/Concord Music Group. Similar to the simple but poignant lyrical style of previous single “Little Lies,” “See You Around” resides in a repetitious space common to folk-style songwriting. Thanks to its quickly rote character, the song itself hovers long in the ear; very easily sung along with well before the track’s second chorus even arrives. Still, despite the highly anticipatory foundation of the tune, the things about which the three women sing jump back and forth between the literal and the metaphorical. This is where the art of subtle complexity finds its place. The whole listening experience is a playful see-saw between symbolism which is physically relatable and that which isn’t. The delicate layers of changing narrative representation don’t even end here though, as the subject of breaking and loss at hand in the verses, vacillates between the tangible and not, as well. One minute the words of another are heard in the gentle waves made by seashells against the ear and the next, a separation of lovers sees the symbol-laden chorus serving as the comparatives for an emotional breakdown of one half to the pair. (So I guess that I’ll be going now / I know you’re looking out for new eyes in the crowd / I’ll see you around / Breaking down like waves down on the coastline…) This application of wordplay and associated vivid imagery written into “See You Around” takes its fundamental use of similes and metaphors and gives the track a whole other dimension of duality, on top of the individual comparisons themselves. enjoyable for many replays over. Though on paper the band’s approach and preferred form of composition and arranging might sound formulaic and-or excessively recurring, the recognizable factor of I’m With Her’s compositions should not be confused with cut and paste, swap and place music. Rather, the unassuming ways in which this band manages to keep straightforward string powered melodies so engaging as opposed to tiresome, should be likened to a handmade patch work quilt. The type of blanket is instantly familiar on sight but each quilt is different, required ongoing motivation to make, and is actually incredibly nuanced once one gets past the bigger pattern and explores the individual stitching. I’m With Her delivers a beautifully quaint, neatly packaged delight in “See You Again,” that throws together the trio’s instrumental precision, a catchy refrain, and emotive performance – the latter of which is achieved with the kind of reflexive effortlessness only possible through the family-level bond O’Donovan, Jarosz, and Watkins share and, with every new piece of music, continue to strengthen. What the rest of the album will bring is sure to be a source of welcome fervor going into the new year. 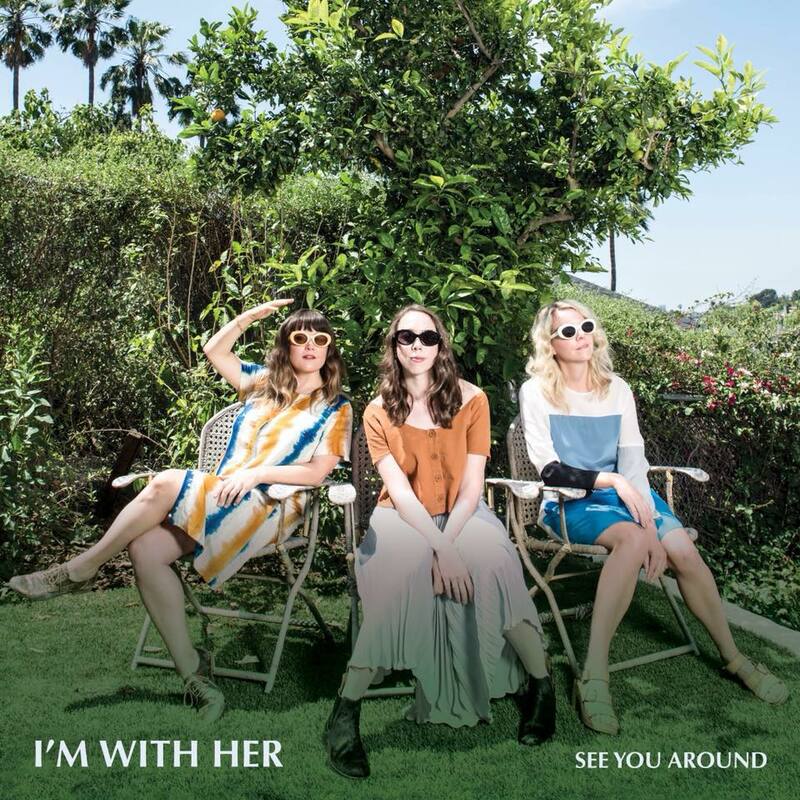 I’m With Her start an extensive amount of touring in January 2018, ahead of the release of See You Around, and play throughout the U.K. And U.S. well into spring. Tickets for the first leg of shows and information on the rest of the tour are available HERE. See You Around is available for pre-order through the band’s online store, Amazon, and iTunes.